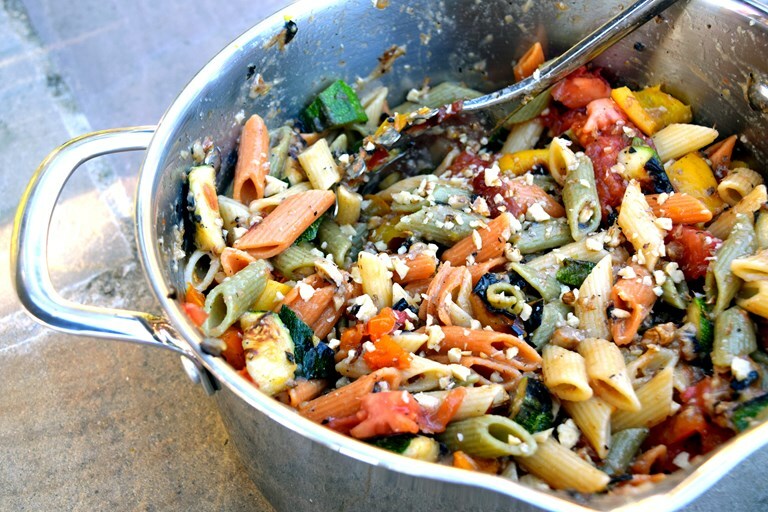 Rachel's vibrant roasted vegetable pasta recipe is a great celebration of Mediterranean colour, thanks to the use of mezze penne tricolour pasta, which is flavoured with tomato and spinach to reflect the green, white and red of Italy's flag. This wonderfully easy recipe is finished with walnuts for a delectable crunch. Probably the easiest summer pasta dish you can throw together with minimal fuss, space and equipment is roasted vegetables, cooked so that they are tender and form their own sauce, tossed together with a pasta shape of your choice (though I always find penne works best, choosing a good tricolour variety like Barilla where you can actually taste the tomato and spinach) and a handful of chopped nuts for a bit of crunch. This is the first dish I make when I move into a new flat (any leftovers are delicious cold), and it is also my perfect go-to on holiday in a rental kitchen. The formula is pretty basic, but there are a few things I like to do to upgrade the dish. While almonds or pine nuts would be the more obvious choice, I find walnuts add a bit of smokiness to the dish. I use a mixture of extra virgin olive oil and unsalted butter to finish the sauce, but you could use just one or the other. While they are delicious chopped and roasted, the vegetables would be even better barbecued in larger pieces then roughly chopped before being added to the pasta. Finally, any soft herbs you have to hand, especially basil, will only make your supper even better.